1. Pool play with a 3 game guarantee. 2. Games will consist of a running clock, except in the last minute of each half. Clock will not stop in the 2nd half if the point differential is 20 points or more. Halftime is a maximum of 4 minutes. 3. Rosters must have a least the minimum number of players (5) listed before being accepted into the tournament. Players may appear on only one roster. Divisions are gender specific. 4. Teams are required to wear matching colored shirts with numbers on the back. 5. At any time, the number of teams per division will be adjusted at the discretion of the Iowa Games staff. 6. No refunds will be issued due to cancellation by weather or team withdrawal after the final deadline. Current grade for 2018-2019 (September 15, 2018 age determining date) school year will be used to determine the grade for participation. Athletes should check with their school’s athletic director concerning participation. Iowa Games cannot be held accountable for determining an athlete’s eligibility. A $25/team discount is available for basketball organizations (clubs, leagues, schools) that enter 4 or more teams. Email katie.kramer@iowagames.org for more information. 1st and 2nd place teams in the each gender/age division will receive trophies for each player. Concessions will be available during the day. As the deadline approaches, some divisions are full. 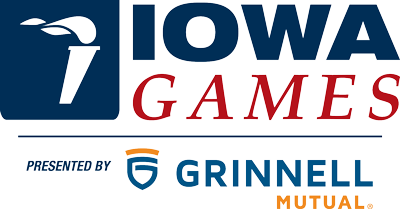 If your division is full and you’d like to be added to a wait list, please call 888.777.8881 or email info@iowagames.org. If we get enough teams on the wait list, we may be able to open up some spots. All divisions based on the 2018 – 2019 school year. Recreation Division (7th & 8th Grade): This division is for park & rec teams, YW/YMCA teams, etc., not for the all-star or select teams. Competitive Division (7th & 8th Grade): This division is for the all-star, select or elite teams. *Iowa Games staff reserves the right to combine divisions (competitive & recreation) if there are not enough teams in each level. Schedules & Results will be available through the Iowa Games app on your smartphone. Click HERE to view on online version of the schedule. Click HERE to view the court layout inside Lied Rec Center. Click on the AppStore or Google Play button below to download and find your team! *Maximum roster is 12 players for the entry fee. Minimum roster is 5 players.